I am trying to set it up so I can monitor my WIFI usage. I put in the address for the router (see picture), but all I get is a blank bar for the WAN Interface. I have tried to edit the hidden settings, but to no avail. I was wondering if anyone has a walkthrough for this? I have tried the UPnP and get pretty much the same. Hoping someone can help me out. 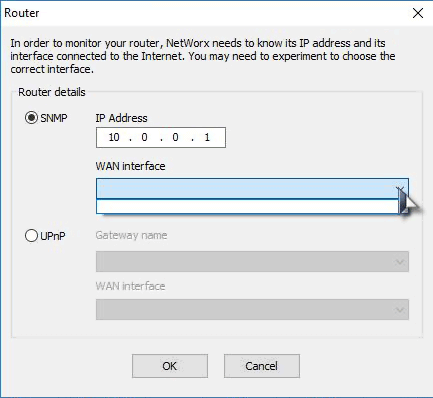 Support the service called WANCommonInterfaceConfig in its UPnP implementation. Likewise, in some routers this feature is present and active out of the box, while in others it may need to be enabled (e.g. by allowing applications to set up port forwarding). I am afraid we aren't really able to provide assistance for a specific router model. It's best to contact the supplier or vendor directly.